Imagine you’re standing in front of Sao Bento train station in the middle of Porto city. You’re facing the train station, admiring the look of a magnificent big building. There are a lot of people around you, traffic is busy. Behind you – tons of coffee shops, little bakeries, full of people, buzzing. You need to cross the main street towards the train station and go to your right, a little side street Rua do Loureiro, relatively quiet, which takes you away from all of the noise. 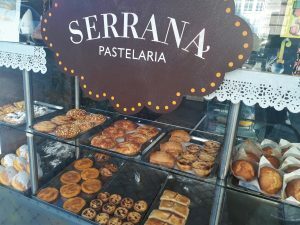 And on this street, on your right you will find Confeitaria Serrana. Away from all of the traffic and noise, away from tourists, it is neatly tucked away. So close to normal tourist spots, but also so far. When I was first approaching this place, I was told that it is an amazing building with a lot of history, but little did I know how amazing this building truly is. When you first walk in, you may think you are in just a standard bakery/café. 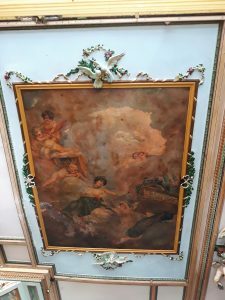 But then you look up… The very first thing that catches your eye is an amazing painting on the high ceiling with ornate elements on its sides. It’s absolutely breathtaking. It makes you wonder if you came to grab a cup of coffee or are visiting a museum. Then you are invited to go explore upstairs. When you go upstairs, there’s more. The stairs alone are a piece of art. Absolutely gorgeous, and you feel like you’ve travelled back in time a century or so. Everything is still in it’s original condition. The upstairs is an open space gallery, overlooking the café/counter and people on the ground floor. 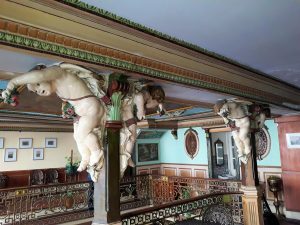 Here you have amazing angels sculptures on columns and many more ornate elements when you look around. 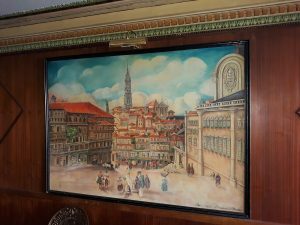 There’s a big painting on the wall picturing Porto train station and the square in front of it, dated 1909. It just adds to the feeling that’s you’re in the museum, rather than a café/bakery. 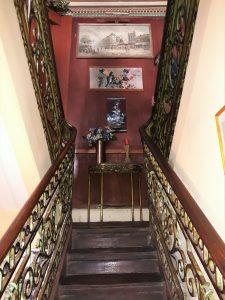 The railings around the gallery level follow the same ornate pattern as the stairs handrail and it adds a lot of charm to this place. 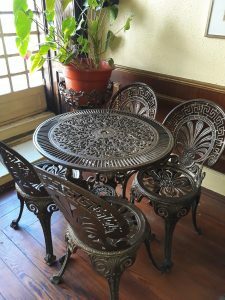 This floor has amazing cast iron tables and chairs around, all with very similar patterns to those on the railings. No matter how amazing this place is, what makes it even better is Monica, who runs Serrana. Monica’s family have been running this business for over 40 years and she grew up helping out in the café. She’s the most welcoming person you could meet, and her warm smile greeted me every time I went there to grab my morning coffee and a sweet pastry. Monica has asked me if I wanted to sign their guestbook as it is very important to her. 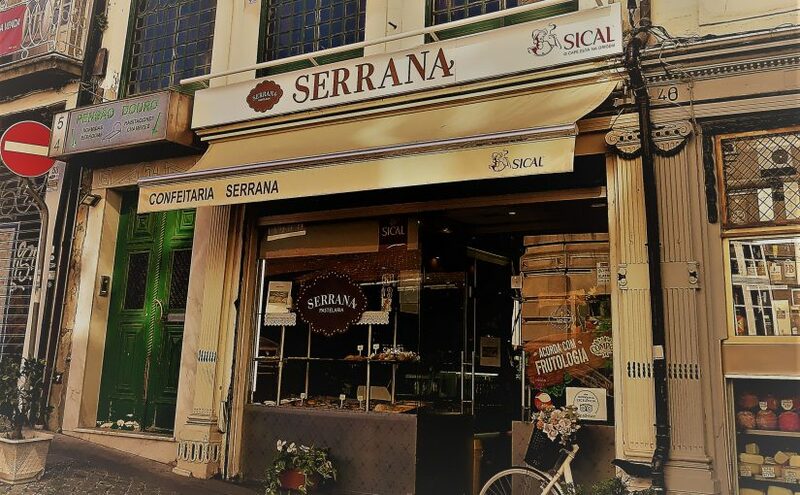 She has explained to me, that a big rich man has purchased the building where Serrana is located and wants to get her family out and wants to turn it into a big money making business. 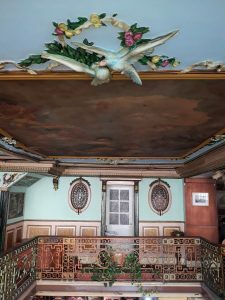 Monica is going to court against this man with support of Porto city mayor to fight for keeping this place open as it is and in Monica’s family’s hands. What Monica was telling me has really inspired me, because we need more places like Serrana in the world. We need small, independent and family run businesses to thrive. 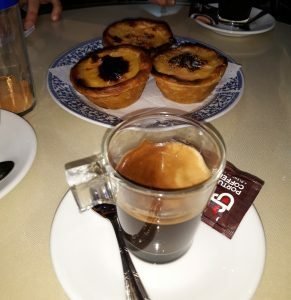 This is the reason why, the whole time I was in Porto, I would go to this exact place for my morning coffee. Even though I walked past at least 5 other cafés on the way there. This place was also the last place I visited before heading to the airport. And when I left, I had the biggest hug from Monica. And tears in my eyes. Because I don’t know if this place will still be there on my next visit to Porto. If you are in Porto and find yourself standing in front of Sao Bento train station, cross the main street and go to side street on the right. Go and visit Serrana. Absorb all of the beauty, enjoy a cup of coffee with some absolutely delicious pastries. And say hello to Monica. Help to keep this place from becoming a money making machine that sells overpriced coffee for allowing you to see it.